Not too far from the Pennsylvania border in New Jersey resides a wrestling club that does it its own way. A place where ongoing development serves as the objective, even though plenty of successful athletes have called the institution home. It’s a concept not lost on the grapplers of the area. 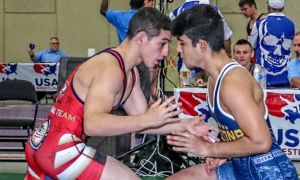 You see, in New Jersey, where the high school folkstyle season has become sort of an all-encompassing pastime, there is a growing segment of wrestlers who are attempting to break through at every level. Participation from November through March isn’t enough. And for those who are interested in gaining insights from a more nuanced and focused approach, the Eclipse Wrestling Club is where they go. Matt Ciampa could be looked at as “the face of the franchise”, so to speak. Don’t misunderstand: Eclipse is very much a team effort. 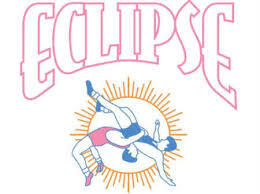 Together with Bobby Shearer, Larry Levinstone, and Anthony Leardi, the staff at Eclipse Wrestling blends experience, understanding, and enthusiasm into a tightly-woven formula which has resulted in dozens and dozens of national place-winners and champions at all levels. It’s just that Ciampa, originally from Summit in Union County, is the voice, the one who’s out there the most. 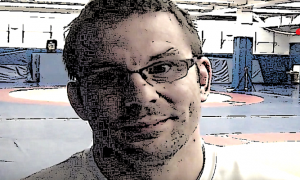 A devout technician, Matt Ciampa was recognized as New Jersey’s Freestyle and Greco Roman Coach of the Year in 2013. He has also been around from the club’s beginning. “There would be like 100 kids and 7-8 coaches in the room at once,” says Ciampa. “You would workout with all the kids in that room. People would come pretty far to work out there. My coach (Rick Broadman) would run one. A bunch of kids started to come. He then got a gym nearby and started to run his own club around 1985.” In order to appreciate this premise, you have to understand the context. In the mid-1980’s, New Jersey was not yet quite the hub of wrestling schools it would wind up flourishing into. Most of the time, extra workout sessions or summer wrestling programs were patched together from open mats at schools or even from private home gyms. Right off the bat, Eclipse was morphing into something different. But that is not the only line of demarcation. 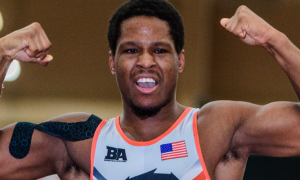 While plenty of wrestling clubs in the state offer all the folkstyle training you could ever want, Ciampa’s crew has gone in a more pronounced direction. “Our goal is for kids to place at Fargo every year,” declares Ciampa. In order to make that mission a reality, you won’t find a ton of “referee’s position” drills going on at Eclipse. Instead, you’re much more likely to catch a litany of gutwrenches, bodylocks, and slide-by’s. That’s because the club concentrates only on the international styles. “We probably more consistently hit back arches and pivots than anything else at practice on a consistent basis,” informs Ciampa. 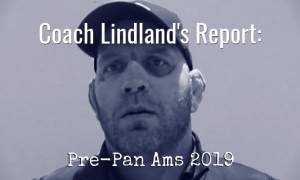 “Anywhere from body throws to finishing a gutwrench or bridging off your back if it comes to that.” It’s a recipe that has served the program well. Just last year, Eclipse wrestlers took home 11 medals from Fargo. Ciampa preaches the finer points because he knows that’s what yield results. “We go over basic skill development, then specific positions which vary from practice to practice and athlete to athlete. From there, it goes to a series of lift exercises, body lifts to swing steps, etc. We always try and finish practice with lifts and throws.” Just on appearance, it would seem that Eclipse is all about Greco. But that isn’t the case. In an era where the debate constantly rages on regarding whether or not US athletes would be better served focusing only on one style over another, to Matt Ciampa, there’s a value in variety. 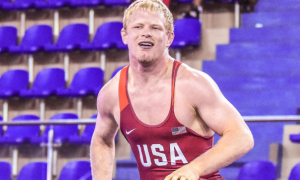 “We over the years have had a stronger focus on Greco more than anything else. I think it’s important kids develop skill sets outside their favorite (style) and translate that to their style of choice.” He might be onto something. After all, Eclipse is the preeminent place to be in New Jersey for that reason alone. To get a clearer picture of the approach, you have to know Ciampa. Technical study, the art of breaking down move after move into infinite detail, is his passion. The way he sees it, one style influences another just as a coach influences an athlete. It’s like a wrestling technique melting pot that allows the student to define what the master is trying to convey. It all leads back to what this is all about for the Eclipse crew. The love of the game fuels the passion. In turn, the passion fosters growth. And that growth is how and why the program continues to be successful. None of this happens by accident. You provide the environment along with a dedicated staff of coaches, and something special is bound to blossom. Wrestling itself is always a work in progress. That very struggle is what separates it from other sports. A good coach knows how to temper that ethos and encourage the new recruits to endeavor towards something greater. 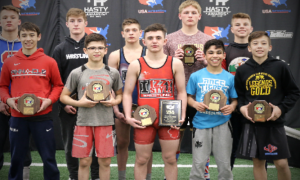 Eclipse wrestlers finished up their annual pre-Nationals camp this past week and are now preparing to make their collective presence felt in North Dakota. Like everything, it’s a process. But with a firmly-established legacy already in place and team of innovative coaches behind the scenes, there’s a good bet some medals will be coming back home to Jersey with them once again. Fargo might not be the only focal point for Ciampa and Eclipse, but the whole experience does play a role in reminding everyone what they’re all about.